Easter is always a tricky time of year to work out when the actual public holidays fall. 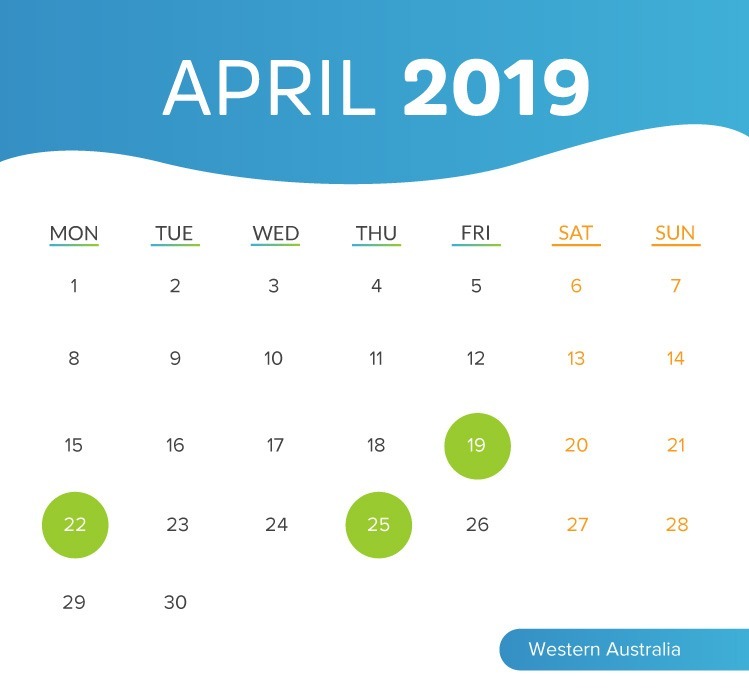 For the Easter period in 2019, the only national public holidays are Good Friday and Easter Monday – all the other days vary between the states and territories. Keep in mind Anzac Day is the following Thursday the 25th of April, and is observed in all states and territories. 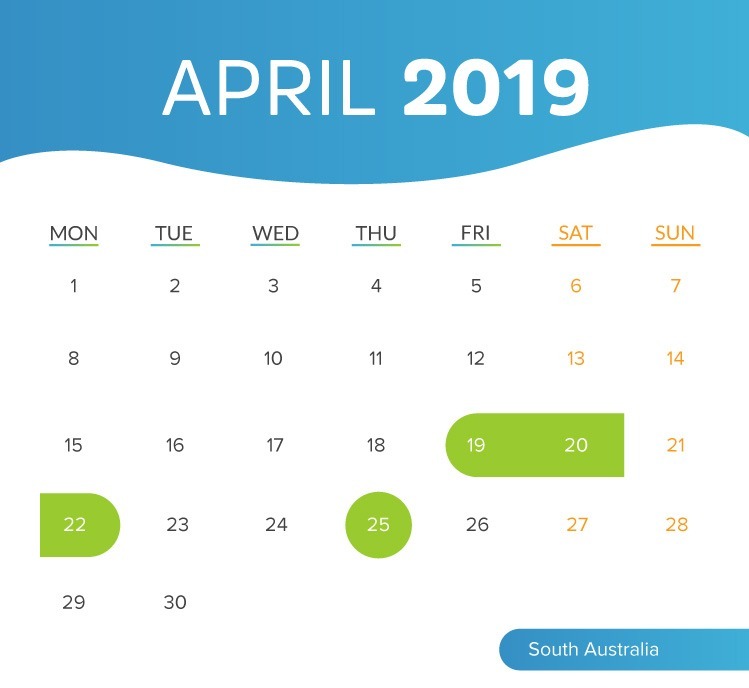 Public holiday penalty rates must be paid for work performed on days that are ‘gazetted’ (confirmed by the government), but the penalties apply differently for different staff classifications. Full-time Full-time employees, who normally work on the day the public holiday falls on, receive a paid day off. This is paid at their base rate of pay, for the ordinary hours they would have worked. An employer can ask a full-time employee to work on a public holiday, given the employee will get paid the relevant penalty for working. Part-time If a part-time employee’s usual hours fall on the public holiday, they will get paid at their base rate for those hours. For the holidays around Easter this year, an employee is not entitled to payment if they don’t usually have ordinary hours of work on the relevant day of the week. An employer isn’t allowed to alter an employee’s roster to avoid a public holiday. Casual Most awards state that casual employees are entitled to be paid at a penalty rate of pay for hours worked on a public holiday. There is no payment for public holidays that they do not work. Check your award or agreement for the conditions that apply to your business. 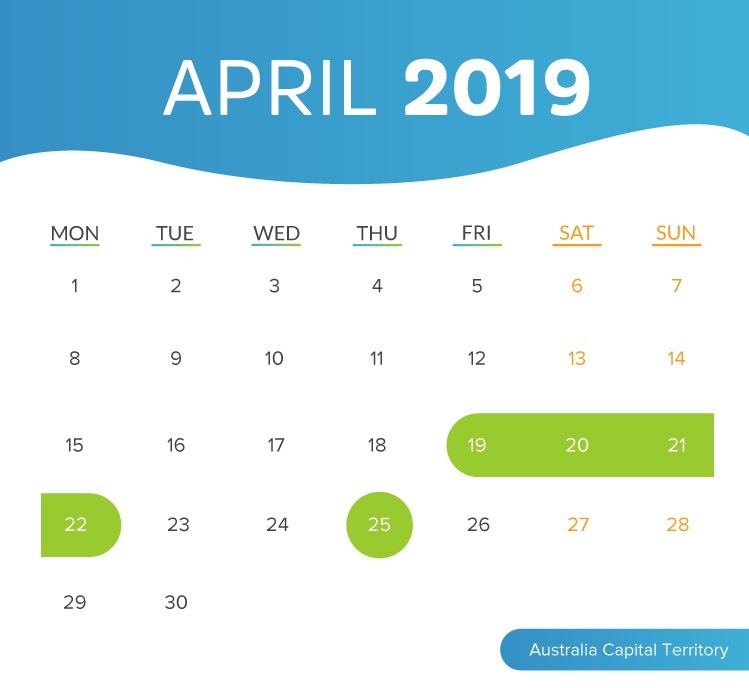 Businesses must observe public holidays in each state for the following days: Australia Capital Territory Good Friday (April 19) Easter Saturday (April 20) Easter Sunday (April 21) Easter Monday (April 22) New South Wales Good Friday (April 19) Easter Saturday (April 20) Easter Sunday (April 21) Easter Monday (April 22) Northern Territory Good Friday (April 19) Easter Saturday (April 20) Easter Monday (April 22) Queensland Good Friday (April 19) Easter Saturday (April 20) Easter Sunday (April 21) Easter Monday (April 22) South Australia Good Friday (April 19) Easter Saturday (April 20) Easter Monday (April 22) Tasmania Good Friday (April 19) Easter Saturday (April 20) Easter Tuesday (this is a restricted public Holiday in Tasmania, observed by some awards/agreements and the State Public service) Victoria Good Friday (April 19) Easter Saturday (April 20) Easter Sunday (April 21) Easter Monday (April 22) Western Australia Good Friday (April 19) Easter Monday (April 22) If you need help paying your staff correctly for the holidays, get in touch with our Compliance Team on 1300 859 117 for a consultation to ensure you are set up correctly. With questions about how awards apply to your business, call the Fair Work Infoline on 13 13 94 or visit www.fairwork.gov.au. Easter is always a tricky time of year to work out when the actual public holidays fall. For the Easter period in 2019, the only national public holidays are Good Friday and Easter Monday – all the other days vary between the states and territories. Keep in mind Anzac Day is the following Thursday the 25th of April, and is observed in all states and territories. Public holiday penalty rates must be paid for work performed on days that are ‘gazetted’ (confirmed by the government), but the penalties apply differently for different staff classifications. Full-time employees, who normally work on the day the public holiday falls on, receive a paid day off. This is paid at their base rate of pay, for the ordinary hours they would have worked. An employer can ask a full-time employee to work on a public holiday, given the employee will get paid the relevant penalty for working. If a part-time employee’s usual hours fall on the public holiday, they will get paid at their base rate for those hours. For the holidays around Easter this year, an employee is not entitled to payment if they don’t usually have ordinary hours of work on the relevant day of the week. An employer isn’t allowed to alter an employee’s roster to avoid a public holiday. Most awards state that casual employees are entitled to be paid at a penalty rate of pay for hours worked on a public holiday. There is no payment for public holidays that they do not work. Check your award or agreement for the conditions that apply to your business. If you need help paying your staff correctly for the holidays, get in touch with our Compliance Team on 1300 859 117 for a consultation to ensure you are set up correctly. With questions about how awards apply to your business, call the Fair Work Infoline on 13 13 94 or visit www.fairwork.gov.au. Sunday Penalty Rates: What’s really happening? The national debate on penalty rates is quickly shaping up to become a defining issue of the Turnbull government and the next Federal election. The debate on penalty rates cuts straight to the bone of modern political disagreement and draws a line straight down one of the most fundamental differentiators of right wing vs. left wing economics. One side of the debate (the left) believes that the Government should regulate labour markets to ensure that the most vulnerable workers in our society are protected against greedy employers, and this will lead to a long term more equitable society. The other side of the debate (the right) believes the best path is to trust the power of the market to set labour rates, the argument is that the hardest workers will naturally attract the highest pay rates and encourage the labour force as a whole to be more productive. At a more practical level, the debate in Australia is concentrated on what to do about Sunday penalty rates which are paid at double time in some industries and whether to reduce those rates to be the same as Saturday rates. There are many institutional, practical and political factors at play which we will try to summarise in this article. Arguments for reducing Sunday penalty rates The argument goes that a reduction in cost of employment on Sundays will simultaneously lift productivity and improve unemployment rates in Australia. Many businesses remain closed on Sunday, because opening is unprofitable. Advocates of the rate cut argue that although some employees would see less money in their take-home pay packet, the overall result will be lower unemployment; not only because more business will trade on Sunday, but because many businesses will choose to increase their service levels (by employing more people) when margins aren’t quite so slim. Arguments against reducing Sunday penalty rates This side of the debate worries that reducing penalty rates will be hurting those in society who need the money the most and should be rewarded at higher rates due to working more ‘unsociable’ hours. Those against penalty rate cuts are generally very sceptical that business owners will create more jobs through the pay rate cuts, and see the proposed cut as a transfer of money from employee’s back-pockets into business owners’ wallets. What about the politics? Not too long ago, specific pay rates for industries were regulated at a State, rather than a Federal level. The move to shift powers of overall rate-setting to the confines of Canberra means that this debate is now being played out on the national stage. The problem for Turnbull and the Coalition is their track-record on labour market reform. As soon as the debate shifts to penalty rates, Turnbull runs the risk of resurfacing some of the toxic politics from the WorkChoices legislation. The problem for the Labour party and particularly Shorten, is how much this fight relies on support from the Union movement. As the political mudslinging begins, this could prove to be particularly bad timing for Shorten following the damning finding of the Royal Commission into Unions. All of this is mixed in with an unpredictable cross-bench, who Turnbull will need to win the support of to push through any change. There is far more at play for both sides than the practical changes to paychecks on Sunday. For both sides this argument flares deeply held ideological principles and is seen as a skirmish on the much larger war on our nation’s attitude towards labour laws, the free-market and the role of government. Get ready for the s**tfight. 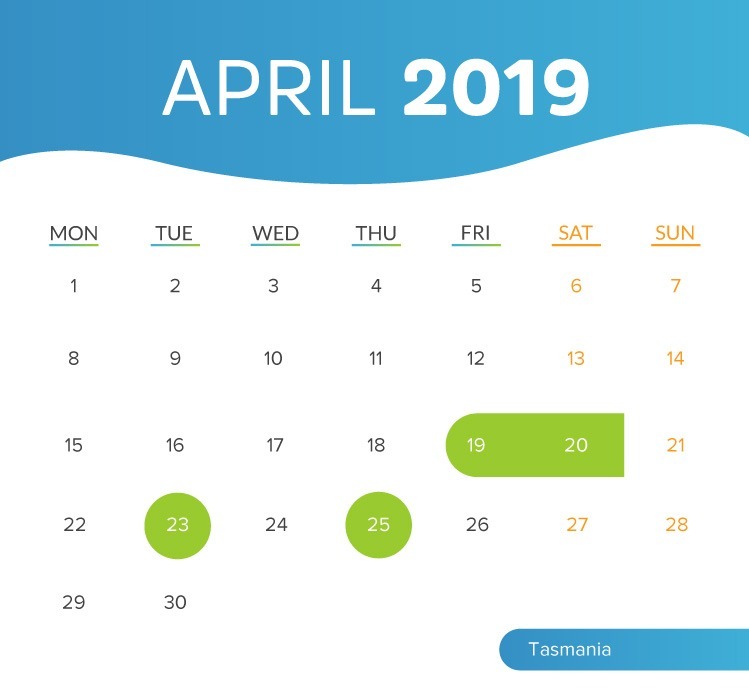 At Tanda, our Award Interpretation software helps businesses ensure they are paying their staff correct penalty rates at different times throughout the week. Fair Work Penalty Rates Decision Source: The Fair Work Commission The Fair Work Commission has today announced that Sunday and Public Holiday penalty rates are to be cut across Hospitality, Retail, and Fast Food Awards, while Saturday penalty rates are to remain the same. Changes to Sunday Penalty Rates Sunday penalty rates for full time and part time hospitality workers will be reduced from 175% to 150%, rates for casuals will remain the same at 175%. Level 1 Employees under the Fast Food Award will see a reduction in Sunday penalty rates from 150% to 125% for full-time and part-time employees. Casuals will have a reduction from 175% to 150%. No changes will be made to Sunday penalty rates for Level 2 and Level 3 Employees under the Award. Full time and part-time retail workers will have Sunday penalty rates reduced from 200% to 150%. Casual Sunday rates for retail will also be reduced from 200% to 175%. Changes to Public Holiday Penalty Rates Public holiday rates for full-time workers in hospitality will be reduced from 250% to 225%, with no change for casual Public Holiday penalty rates. Changes to Public Holiday rates will come into effect July 1, 2017. However, The Commission has stated that the immediate implementation of updated Sunday penalty rates would create undue financial distress for Sunday workers. As such transitional arrangements for Sunday penalty rate changes will be made in the coming months. The decision was handed down after more than eight months of deliberation, and comes after The Productivity Commission recommended bringing Sunday penalty rates into line with Saturday rates in 2015. This is the biggest Industrial Relations decision The Fair Work Commission has made in recent years. It is hoped that reducing penalty rates will bring about more ‘positive employment effects’ for businesses, and will “lead to increased trading hours, an increase in the level and range of services offered on Sundays and Public Holidays and an increase in overall hours worked.” With the outcome of the decision expected to come into play later this year, it is crucial that business owners have the correct tools and processes in place to update changes to wage rates correctly, and better manage their labour costs to capitalise on the penalty rate reductions. Lauren is a Compliance Consultant with a background in industrial relations law. She helps business owners navigate the complexity of the Australian employment law landscape, and is passionate about ensuring staff get paid correctly, on time, every time.